Great time to get a deal and purchase something new and unique. The Ribbon Plumeria Pendant is a stunning 14K gold pendant of a ribbon design that forms the shape of a traditional Hawaiian Plumeria flower. It comes in Small, Medium and Large sizes and has a matte outlay finish intertwined with a glossy inside. 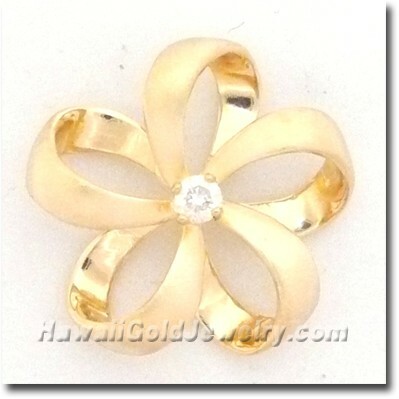 This Ribbon Plumeria Pendant also comes in two varieties, one with a Diamond in the center and one without. It will add a simple yet elegant "bling" to any clothing ensemble! Be one of the first have this beautiful new item. Ribbon Plumeria Earring is a stunning 14K gold earring of a ribbon design that forms the shape of a traditional Hawaiian Plumeria flower. It comes in Small, Medium and Large sizes and has a matte outlay finish intertwined with a glossy inside. 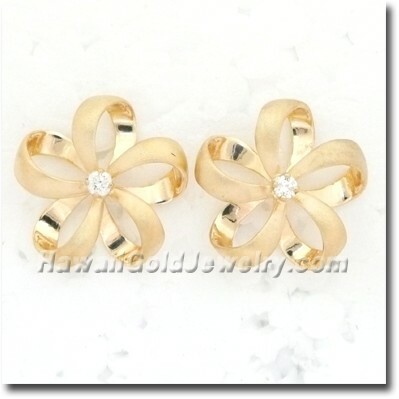 This Ribbon Plumeria Earring also comes in two varieties, one with a Diamond in the center and one without. It will add a simple yet elegant "bling" to any clothing ensemble! Be one of the first have this beautiful new item. 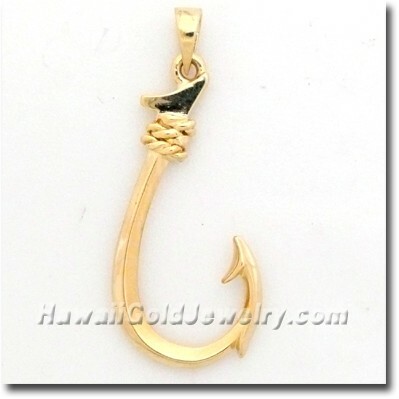 The Fish Hook is a dazzling 14K gold Fish Hook pendant. This lustrous gold pendant is delicately crafted and features the elegant design of a traditional Hawaiian fish hook. It comes in one size at this time - medium. Definitely a great catch! Ideal gift for men.